Peter Cocuzza, professor in the Department of Theater and Dance, directs the production. General admission is $12 for adults ages 18 and up, $10 for seniors ages 65 and up, and $10 for SIUE faculty, staff, retirees and non-SIUE students. Admission is free for SIUE students with valid identification. To purchase tickets, visit the Theater and Dance Box Office in Dunham Hall, room 1042b. Tickets can also be obtained by calling 618-650-2774 or toll free at 1-888-328-5168, extension 2774. For more information, email theater-tickets@siue.edu. For directions and parking, visit siue.edu\maps. The story takes place in the home of the wealthy Orgon, where Tartuffe—a fraud and a pious imposter—has insinuated himself. He succeeds magnificently in winning the respect and devotion of the head of the house. 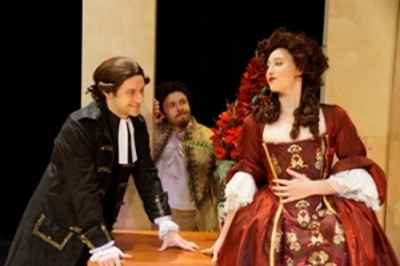 Tartuffe then tries to marry Orgon’s daughter, seduce his wife and scrounge the deed to the property. An emissary from King Louis XIV arrives in time to recover the property, free Monsieur Orgon, and haul Tartuffe off to jail. His duplicity is finally exposed and punished, but not before the author, Molière, has mercilessly examined the evil that men can commit in the guise of religious fervor, and the dangers that imperil those who would believe only what they choose to believe despite a mountain of evidence to the contrary. Because of Molière's comedy, contemporary French and English peoples use the word “Tartuffe” to designate a hypocrite who exaggeratedly feigns virtue, especially religious virtue. SIUE’s Department of Theater and Dance presents four plays and one dance concert during its October through April season. All productions are open to the community at large. The Department of Theater and Dance is part of the College of Arts and Sciences. Shown left to right are Oliver Bacus (Tartuffe), Hannah Warntjes (Elmire) and (under the table) Trey Ball (Orgon).